TRISH KAUFMANN was introduced to Confederate postal history in 1965 and quickly became engrossed in exhibiting, writing and research on the subject. She served as editor of The Confederate Philatelist (CP), official publication of the Confederate Stamp Alliance, from 1973-1987 and co-editor prior to that from 1970-73, a total of 17 1/2 years, a record number for any editor of the CP. She has served off and on over the years as associate editor to various other editors and has been a Contributing Editor since 2013. CSA President Jim Monroe appointed Kaufmann Editor-in-Chief of a major catalog project in late October 2006 after announcing the acquisition of the rights to The New Dietz Confederate States Catalog and Handbook, last published in 1986. The 2012 volume is titled the Confederate States of America Catalog and Handbook of Stamps and Postal History, "CSA Catalog" for short. The CSA Catalog sold out in only three months. It won the Grand Award for Literature at the APS StampShow 2013 in Milwaukee as well as awards in other national and international literature competitions. Compliments received on the catalog. Trish is Past President of the Confederate Stamp Alliance, serving almost three years from January 2008-September 2010, the first woman to ever hold that position. She was also the first woman and the youngest person ever bestowed the permanent honorary title of "General" in the Confederate Stamp Alliance (1985) and has won the CSA Haydn Myer Award a record three times for service to the Alliance as well as three times winning the August Dietz Award for research and writing. She was an active member of the CSA Authentication Service from 1996-2014 and served as the Recording Secretary from July 1996 through November 2007. She resigned with over 18 years of service in late 2014 only because other activities overwhelmed her but was voted Emeritus Status to the committee, still serving as an outside consultant. 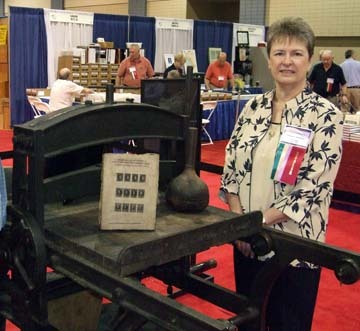 She has won numerous exhibitor awards including Grand and Reserve Grand Awards in national philatelic competition with both her Confederate and Classic Valentine collections. 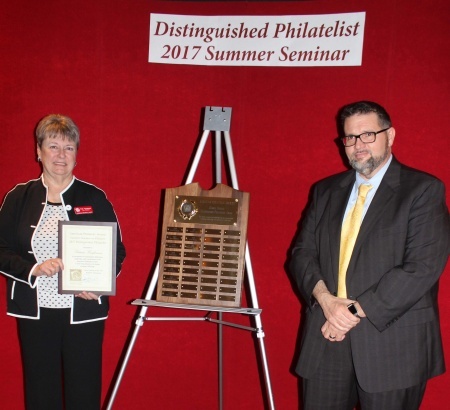 2017 was a banner year for awards, among which was her induction into the philatelic Writers' Hall of Fame in Writers' Unit 30 of APS, recognition as Distinguished Philatelist of the Year at APS Summer Seminar, as well as the Helbock Prize for the best article in the 2016 volume of La Posta, co-winner of the best article in 2016 in the Confederate Philatelist, and a Large Vermeil in literature competition at APS StampShow 2017 along with Steve Roth and Frank Crown for co-authoring The Springfield Facsimiles of Confederate Postage Stamps. In April 2016, at St. Louis Stamp Expo, she was presented the prestigious Elizabeth Pope Award for Lifetime Contributions to Philately. The prior evening, she won the CP (Confederate Philatelist) Writers' Award for the best article in 2015. In June 2016, members of the American Philatelic Society elected Trish among a slate of three to the 2016-19 term as Board of Vice Presidents to serve with Robert Zeigler and Jeff Shapiro. Trish serves as chair of that board and looks forward to the challenges ahead. In December 2016, he was also named to the Council of Postal Collectors, a national advisory group to the hobby comprised of leaders across the hobby and other institutions such as the US Postal Service and Smithsonian National Postal Museum. Trish also serves on six other APS committees; she is Chair of the APS Dealer Advisory Council. She was elected to the Council of Philatelists of the Smithsonian National Postal Museum in January 2011, serving unofficially for a year before that. She served on both the Research Committee and the Public Relations / Web Committee of said institution. Trish also served as a researcher for their extensive cataloging project, "Arago", which was unveiled May 27, 2006. She was delighted to be able to serve during the exciting creation of the new William H. Gross Gallery, which greatly expanded public access to the national postal collection. The Gross Gallery opened September 22, 2013. Trish was a section editor of The Confederate Stampless Cover Catalog as well as a contributor to the 1986 New Dietz Confederate States Catalog and annual updates of the Scott Specialized Catalogue. She has written hundreds of philatelic research articles, primarily on Confederate postal history for The American Philatelist, The Congress Book, Smithsonian Magazine, Way Markings, The Confederate Philatelist, La Posta, The SPA Journal and other publications. Since January 2007, Trish has written a monthly column entitled "The Confederate Post" for The American Stamp Dealer and Collector and serves as an Associate Editor. These are partially archived on this website on the articles page. Trish has also been surprised by special features What's Up in October 2016, First Word in April 2008, as well as Profiles & Leaders | People who have moved the hobby forward where she was profiled in the February 2014 issue of The American Stamp Dealer and Collector. 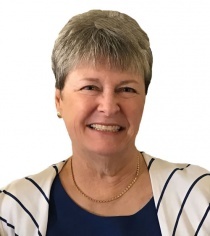 Trish also regularly writes for the Confederate Philatelist and serves as an associate/contributing editor, and is a regular columnist for La Posta as well as Kelleher's Stamp Collectors Connection. Many columns are archived on this site under "Articles." Society affiliations include life memberships in the American Philatelic Society, Confederate Stamp Alliance, U.S. Philatelic Classics Society, and the American Philatelic Research Library, of which she is also a patron; she is a member of the American Stamp Dealers Association, Collectors Club of New York, Fellow of the Royal Philatelic Society of London, and belongs to numerous other collector and dealer organizations. She served on the board of directors as the first female member of the American Philatelic Research Library 1983-89, the Society of Philatelic Americans (also Publicity Director and Advertising - 1973), the Virginia Postal History Society, NAPEX, and the World Stamp Expo Advisory Board to the U.S. Postal Service. She is also a financial supporter of the APS Young Philatelic Leaders Fellowship program. Trish was on the CSA Postmaster Provisional Revision Committee working with the publishers of the Scott Catalogue to revise this important section of Scott, as well as serving in a similar capacity revising the Confederate section of the Minkus Catalogue. She works regularly with the Scott Catalogue editors to maintain the Confederate sections of Volume I and the Scott Specialized Catalogue. It was Trish's definitive research on the 3-cent 1861 Postmaster Provisionals, published jointly in both the 1984 and 2000 American Philatelist and The Confederate Philatelist, that resulted in an entirely new Confederate section in the 2000 Scott Specialized Catalogue, as well as the CSA Catalog. Her research was a 16-year project, which ultimately disproved the misconceptions of over a century of prior catalog listings - both U.S. and Confederate. Her second article, dedicated solely to the Madison C.H., Florida 3-cent postmaster provisionals, is reproduced with full color illustrations on this Web site. She has given numerous presentations on the Madison project over the years. 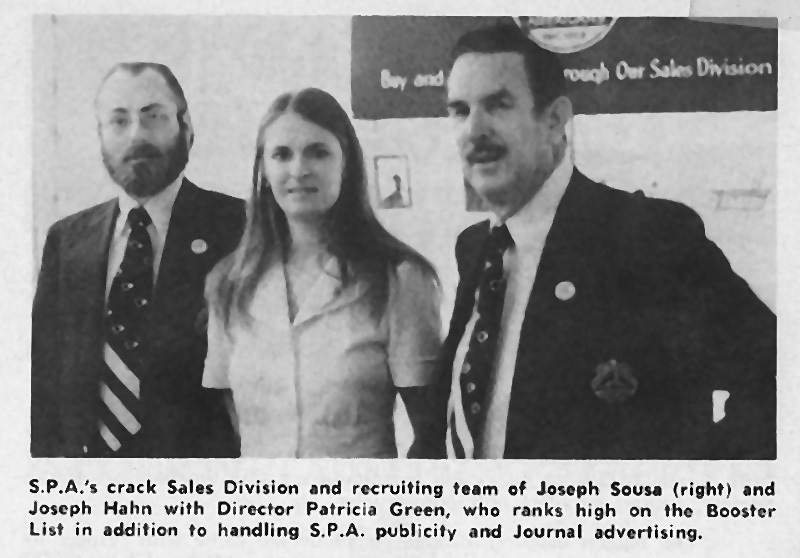 In 1973, she was hired by John Kaufmann as his first employee and, together with him, formed the Washington, D.C. philatelic auction house of John W. Kaufmann, Inc. where she served as Vice-President until John's death in 1988 when she took over as President. John and Trish were married in 1975. Trish was one of the first female auctioneers in the country, calling her first sale in 1973, and served as office manager as well as auction describer. She closed the business in 1989 when she began working as a consultant for Stephen J. Osborne, a dealer in the United Kingdom. In September 2000, Osborne moved his business back to England and Trish decided to narrow her philatelic niche to Confederates only. With 50 years of philatelic experience, Trish works as a professional philatelist and holds the premier Confederate retail stock in the country. She was qualified as a philatelic expert witness in 2003 and is available for court testimony in the fields of Confederate States stamps and postal history, as well as appraisals. Trish takes her retail stock on the road a few times a year and can be found with a bourse table at the two yearly Confederate Stamp Alliance conventions, the American Philatelic Society annual convention, which moves around the country, as well as at her old stomping grounds at NAPEX in the Washington, DC, area every June. Above right shows Trish posing with the Hoyer & Ludwig Confederate stamp press formerly owned by August Dietz. The photo was taken at the 75th anniversary of the Confederate Stamp Alliance in Richmond, Virginia, in August 2010 where she presided as President. On a personal level, Trish was happily remarried in 1992 to Capt. Darryl Boyer. For fifteen seasons, together they ran a wreck diving charter boat, Surface Interval, from 1991 through 2005. The sale of their boat in December 2005 gave Trish the opportunity to expand her philatelic sales department. 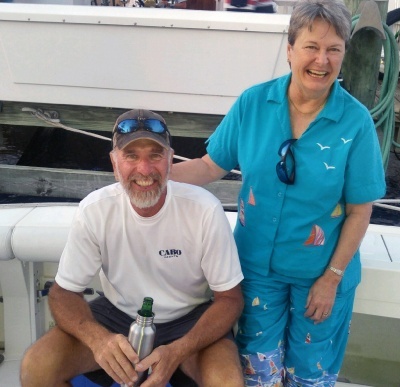 Darryl and Trish met while diving off the Mid-Atlantic coast of Virginia in 1990 while she was training to become a SCUBA instructor and he was looking for a dive boat to buy. Although no longer an active Rotarian, she was the first woman elected to the Princess Anne, Maryland Rotary Club in 1990. Trish is also very involved in her calling to Reformation Lutheran Church in Milford, Delaware, where she created and maintained the church website for 17 years before relinquishing that job in 2013. She also enjoys lifting her voice in praise as a tenor in the chancel choir.